In addition to new gilding work and restoration, I also provide replacement reverse-painted and eglomise panels for mirrors. This carved wooden fish was gilded for a client in 2005. Approximately 30" long. This pair of small convex mirrors needed complete regilding, but still needed to look old. More about this project here. This mirror was restored, and a replacement panel made showing a local scene. More about this project here. 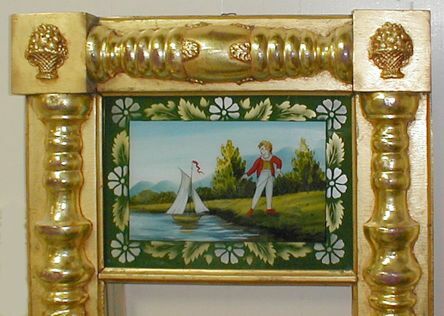 This large frame was damaged when the painting feel from the wall. See more about this project here. 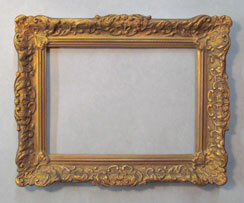 English portrait frame.The goal of this restoration was to replace gold overpaint with a gilded surface that would look more in keeping with the artwork and its period. For more information on this project, click here. Oval Victorian mirror. This mirror was in poor condition, with major old breaks and missing elements, but the goal was to bring it to more complete form, but retain the elements of decay to the surface. For more information on this project, click here. Federal style mirror. For more information on this project, click here. Continental clock case. For more information on this project, click here. 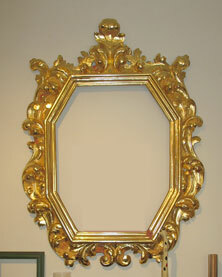 Italian rococo mirror. For more information on this project, click here. Replication of a painted glass mat with gilt band. For more information on this project, click here. 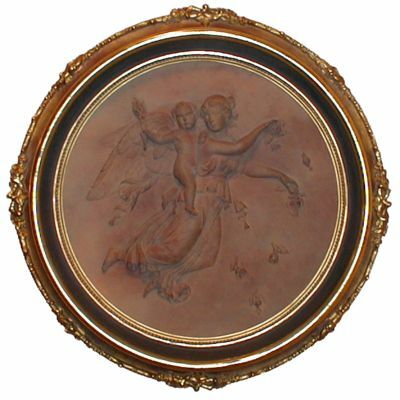 Framed plaster bas-relief ca. 1900. When purchased, the plaster was broken into several pieces, and the frame had been damaged and overpainted. For more information on this project, click here. Sheraton mirror ca. 1835. Carved and gessoed ornament of grapes. The ornament was broken into several pieces (fortunately all present). This was reassembled, but no new material was added. Since this mirror had much of its original gilding still intact after the removal of layers of heavy gold paint, I elected to lightly water gild without removing the original material to the wood/gesso below. This revived the surface, while still maintaining signs of age and wear. Another typical Empire period split baluster with heavy, rope-turned balusters and composition ornament on corner blocks. I really like the boldness of this period. Needed complete regilding (under the gold overpaint I also found avocado green "antique finish", probably done circa 1970. The reverse-painted tablet that came with this was old, but possibly not original. In addition, it was one of the ugliest ones I had ever seen. I was almost glad there was a chunk off of one corner, as it gave me an excuse to do a different one. More reverse-painted and eglomise panels for mirrors. Federal style convex mirror. More information. Italian plaster placque. More information. 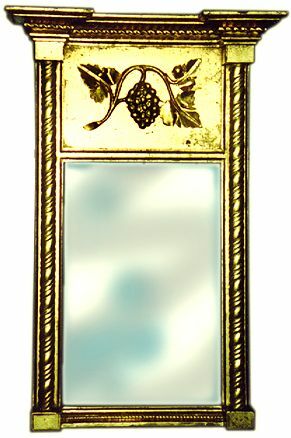 Baroque style mirror. More information. Gilt "split column" mirror found in attic. More information.